Have you ever noticed the thin film between the shell and the egg white when you crack a hard-boiled egg? This is the eggshell membrane and it is loaded with joint-cushioning and flexibility enhancing vitamins, amino acids and proteins. While you may want to run to the kitchen to hard boil all of your eggs right now and peel away this membrane, this may not be a realistic method for getting the amount that you need. “Supplementation with NEM produced a significant treatment response at seven days for flexibility and at 30 days for general pain, flexibility and ROM-associated pain.”1 “ROM” stands for “Range-of-Motion”. Put the Pep back in your Step with flEGGsible! 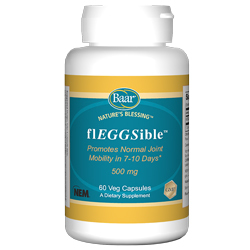 Nature’s Blessing™’s new Natural Eggshell Membrane (NEM®) supplement, flEGGsible™, naturally contains glucosamine, hyaluronic acid, collagen, chondroitin and more in an easy-to-take capsule. All of these substances help to cushion the joints, promoting ease of movement in your daily activities. Are you ready to bend, stretch and move with ease? Start supplementing with flEGGsible today! Ruff, K. J., DeVore, D. P., Leu, M. D., & Robinson, M. A. (2009). Eggshell membrane: A possible new natural therapeutic for joint and connective tissue disorders. Results from two open-label human clinical studies. Clinical Interventions in Aging, 4, 235–240. Berardi, J. Eggshell Membrane Reduces Joint Pain. Precision Nutrition, Inc. http://www.precisionnutrition.com/eggshell-reduces-pain. This entry was posted in Bone, Joint, and Muscle Health, Natural Products, New Products on October 14, 2015 by Dr. Bruce Baar. You probably have Olive Oil in your kitchen, but do you have any in your bathroom cabinet? This versatile oil has been used for centuries not only for cooking, but also for personal care. Rich in vitamins, antioxidants and essential fatty acids, it provides intense nourishment for hair, skin, nails, lips and more. There are countless uses for Organic Olive Oil and more are being discovered every day. Organic Olive Oil provides your skin with the nutrients it craves. It has the exceptional ability to penetrate deeply, leaving your skin feeling soft and smooth from head to toe. This moisture-trapping emollient envelops your skin forming a protective barrier against dirt and bacteria without clogging pores. It enhances skin elasticity, relieves swelling and restores and repairs damaged skin. Massage: During massage, Organic Olive Oil absorbs quickly to ease muscle stiffness, relieve ligaments and tendon strain, renew dry chapped skin and stimulate muscular strength. Soothing Bath: Mix a few drops of your favorite essential oil with several tablespoons of Organic Olive Oil and add to your bath water. Indulge yourself in an aromatic, revitalizing soak and emerge feeling renewed. Exfoliator: Add a small amount of Sea Salt to Organic Olive oil to create a natural exfoliating scrub for your face or body. This mixture will remove dead skin cells, leaving your skin feeling silky soft and smooth. The antioxidants in Olive Oil work to calm the effects of acne, reduce redness and soothe minor skin irritations. Applied to the hair, Organic Olive Oil hydrates and seals in moisture for shiny, strong, touchably soft locks. It may be used by itself as a treatment or mixed with other beneficial ingredients for intense conditioning. Scalp and Hair Treatment: For shiny, softer hair, massage Olive Oil into your scalp and hair and cover with a shower or swim cap for at least 30 minutes, then shampoo. Organic Olive Oil wraps your strands with delicate moisture to nourish dry, brittle hair that is prone to breakage. Added ingredients: Add one egg or a few teaspoons of lemon juice to your warm Organic Olive Oil. Work this mixture into the scalp and hair for an extra conditioning boost. These mixtures help renew lifeless hair, leaving it soft and manageable. Nails and the skin around them can often become dry and brittle. Rather than using chemical laden lotions, rub some natural Organic Olive Oil into your cuticles and nails and experience its moisturizing and skin repairing benefits. Cuticle treatment: Rub Olive Oil into your cuticles daily to prevent hang nails and cracking skin. For extreme dryness and cracking, soak the fingers in a bowl of warmed Olive Oil for 15-20 minutes. This allows the oil to penetrate deeply into the skin and nails, giving them new life. Add this nurturing oil to your daily beauty routine and let the revitalization begin. Do you use Olive Oil in a unique way? Please share with us! This entry was posted in Hair Health, Natural Products, New Products, Organic Products, Skin Health on August 25, 2015 by Dr. Bruce Baar. In ancient times, Gold was valued for its beautifying benefits and anti-aging properties. Cleopatra, a woman renowned for her astounding beauty, was known to apply masks made of Gold every night to maintain her youthful appearance and flawless complexion. In the early 1900’s, Edgar Cayce advised packing the sand (from Virginia Beach) about the body because of its Gold content. It was said to produce a stimulating effect to the body’s circulation. Today, Gold is used in many cosmetics for its ability to relieve swelling, tone and tighten skin, restore elasticity and smooth wrinkles and fine lines. The antioxidant protection of Gold helps guard skin against environmental stressors which damage and age skin. Gold promotes cell revitalization, encouraging collagen and elastin renewal which keeps your skin looking young, radiant and smooth. A Natural Skin Cream worth its Weight in Gold! Jojoba Oil is abundant in vitamins and minerals and powerful anti-oxidants that drench the skin with nutrients to moisturize, soften, restore and renew. Rose Hip Seed Oil is high in vitamin C, vitamin A and essential fatty acids. It soothes, hydrates and revitalizes dry, damaged skin while reducing the appearance of fine lines and wrinkles. Organic Almond Oil is nutrient-rich in vitamins A, D and E. It has a calming, soothing effect on the skin, is easily absorbed and will not clog pores. Organic Olive Oil has been called nature’s liquid Gold. 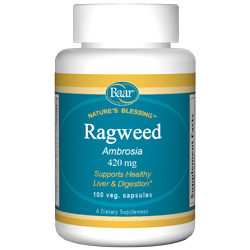 It is loaded with minerals, essential fatty acids and vitamin E that combine to ward off damaging free radicals. It absorbs quickly to moisturize and restore skin health without leaving a greasy film. Vitamin E is a natural antioxidant which helps bolster the skin’s defenses. Its anti-inflammatory properties help protect, calm and hydrate sensitive skin. 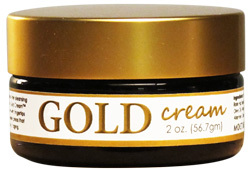 Gold Cream is the perfect indulgence for your skin. This unique cream is truly worth its weight in Gold! This entry was posted in New Products, Skin Health on July 20, 2015 by Dr. Bruce Baar.